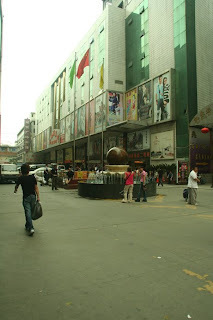 Guangzhou’s Clothing Market – wow! 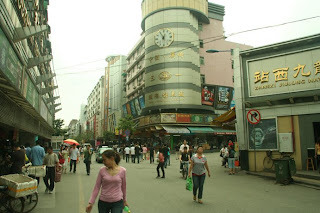 The population of Guangzhou metropolitan is estimated to be 8.5 million people. That’s 8.5 MILLION! That’s New York City’s 5 boroughs combined. 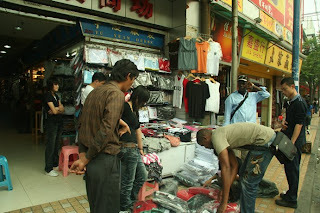 Guangzhou city is known for it’s clothing and fabric market and it draws a lot of the Chinese from near by cities. 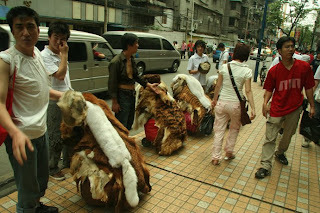 In addition clothing is a major part of the Chinese society as China is the highest producer of clothing and textile. …things are done quite different from any other country. With this type of market demand the culture and the way things are done are quite different from any other country. In Guangzhou city I was staying with my friend Jacky. His aunt owns a factory and has a friend that produces smaller production runs which is perfect for JUZD. 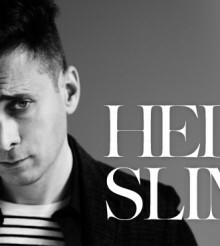 We headed over to the clothing market to see him. We were dropped off right in the eye of the busy market. It was early in the morning midweek, some shops weren’t even open yet and there were already customers and foreigners lining up for a deal. Each shop is clean and well organized. Most shops are the size of a small 100 square feet tradeshow booth. Yet there were many shops and much were squeezed into each. Quickly I noticed a consistent theme. Everything they sold were knockoffs. There were many vendors and each vendor had many items but they were the same. Knockoffs, knockoffs, and knockoffs. I felt sick to my stomach. Not only am I strongly against knock offs, I even hate it when one brand produces a similar design as another. The choice of knock offs for the day are American Eagle, Ed Hardy, Abercrombie and Fitch, and good old Nike. They don’t like it when you take pictures in the mall. I guess they are scare that you will knock off their knock offs. …doesn’t make sense doing an original brand. Right on top of these knock off shops were their sales office. Each of these shops had a factory. Where? Were they sweatshops? I don’t know. I did not enjoy the vibe from this area and did not want to venture to the appointment but to save face I went. Overall everything was professional and clean. From the stores to the office. And the knockoff designs were pretty good. Creative. But did not even want to go near the product to see the quality and construction. I would have given them a little respect if it was their own brand. But the market demand knockoffs. Base on the economics, for a small Chinese shop it doesn’t make sense doing an original brand. I’ll pay the higher price and maintain my principle, thank you! I got a quote for the production of some of the designs and the cost of shocking. Some of the cost were 1/5 of what I was paying. They wanted me to ship my custom made bamboo fabric to them for producing the shirts. As attractive as the offer was I won’t switch my factory even just for the simple fact that I can’t see JUZD line made by a knock off specialists. I’ll pay the higher price and maintain my principle, thank you! 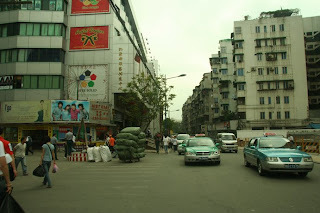 Apartment buildings are right across the street from the clothing market. In China there is less restriction on zoning so you’ll see mesh of commercial and residential buildings side by side.